Smith and Wesson Knives for sale are available in assisted opening designs, tactical and survival styles. Popular with Military and Police units, Smith and Wesson offers a performance series of items proudly made in the United States since 1852. 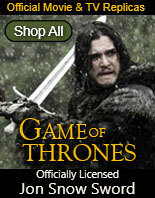 Buy all types of S & W items from liner locks and EDCs to survival knives and more all on sale now. Smith and Wesson Special Ops Dive Watch and Knife Set for sale includes the Extreme Ops Liner Lock which measures 4 1/8th inches closed. The knife has a partially serrated tanto style blade. 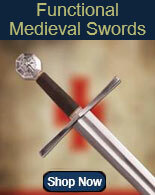 The blade is manufactured of 440C stainless steel and has a black titanium powder coating. The Extreme Ops Liner Lock has an ambidextrous thumb stud, a black aluminum handle with a drilled hole design and a stainless steel pocket clip. The Special Operations Diver Watch has a black face with white numbers. It has a black rotating bezel, second hand and date. The black nylon wristband has an integrated compass. The Special Ops Dive Watch is rated to be waterproof to 300 ft. The set comes in a gift tin. Buy the Smith and Wesson Special Ops Dive Watch and Knife Set for only $49.99. Smith and Wesson Military & Police Linerlock knife is 4 1/4" closed. Partially serrated black Teflon coated 4034 stainless tactical style blade with dual thumb studs. Desert tan anodized aircraft aluminum handles with black rubberized inlay and integrated glass breaker. Black finish stainless pocket clip. M.A.G.I.C. assisted opening blade for $49.99. Cannot be shipped to N.Y.
Smith and Wesson Military & Police Linerlock knife is 4 1/4" closed. Partially serrated black Teflon coated 4034 stainless tactical style blade with dual thumb studs. Dark Grey anodized aircraft aluminum handles with black rubberized inlay and integrated glass breaker. Black finish stainless pocket clip. M.A.G.I.C. assisted opening blade for $49.99. Cannot be shipped to N.Y.
Smith and Wesson Military & Police Large Assisted Opening Linerlock 2nd Generation. Knife is 5" closed. 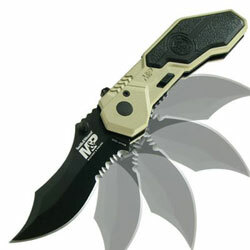 Black finish 4034 stainless partially serrated assisted opening blade with thumb lug. Blade is etched M&P. Black aluminum handles with black sure grip rubberized inlay. Integrated glass breaker. Pistol style side safety lock. Black finish stainless pocket clip for $49.99. 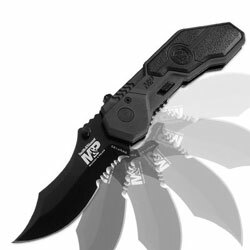 Cannot be shipped to N.Y.
Smith and Wesson Homeland Security Survival Knife for sale features a black 8 ¼ inch, titanium powder-coated tanto style blade made of 440C stainless steel. These full tang knives measure 13 ¾ inches in all and feature a green G-10 handle. The handle features a lanyard hole which adds to the tactical and rugged feel of the knife. They include a black, heavy nylon belt sheath that has a hard shell interior liner and a stone pocket. These knives weigh approximately 17.5 ounces. 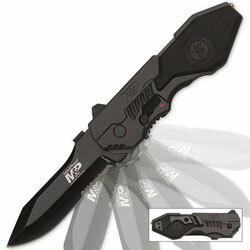 Buy the Smith and Wesson Homeland Security Survival Knife for only $59.99.